1. Every mother of our puppies will have a V or VA championship ranking, OFA hip and elbow normal certification and have parents who are V and VA dogs, or be first generation offspring from VA champions. 3. All of our dogs are our family and live with us in our home and yard. 4. All of our puppies are raised in our house and are loved and well socialized. 5. All of our puppies receive individual advanced early neural stimulation training and score high on puppy aptitude testing. 6. All of our puppies will be current on shots, de-wormed, microchipped and have AKC registration papers and three generations of pedigree. 7. Our breeding program of excellence adheres to the SV and GSDCA highest standards, the AKC breeder of Merit standards, and the AKC breeder of Heart program. 4. 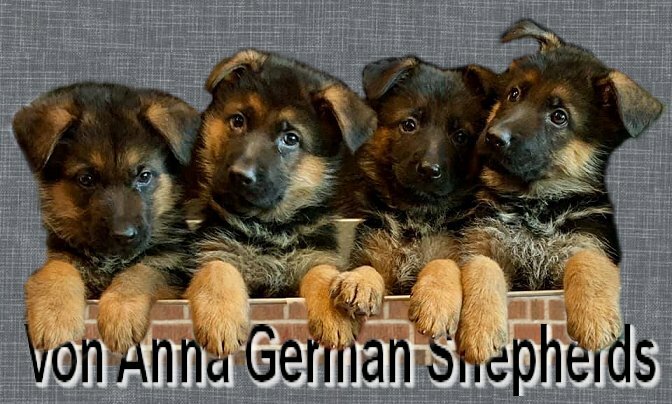 Every buyer will be provided with AKC registration information of their German Shepherd puppy to obtain a 4 generation pedigree. While no German Shepherd Breeder can honestly provide a “Hips and Elbow Guarantee” as occasionally a recessive gene will express itself, We certify that all of our dogs come from four or more generations of hip and elbow certified normal dogs giving you the greatest chance of having a hip and elbow normal dog. We will replace at no charge any dog that does not pass OFA hip and elbow certification at age of 2 (two) years old.